Preheat the oven to 400°F and lightly spray a 12-well muffin pan with nonstick cooking spray. In a large bowl, stir ingredients together until just combined - do not over mix. Divide the batter evenly into the prepared pan. Bake for 12 to 15 minutes or until cooked though. 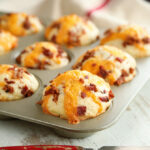 To make these look pretty, I saved out about a tablespoon of bacon and a few tablespoons of cheese and sprinkled it on top of the batter once I scooped it in into the muffin pan right before baking.